"If you live here, you should start thinking about evacuating, too..."
Initially I thought the orange glow was from the family behind my house's party, but then I heard yelling and sirens. I went outside to see a cluster of police cars, a lot of people and one fire engine. 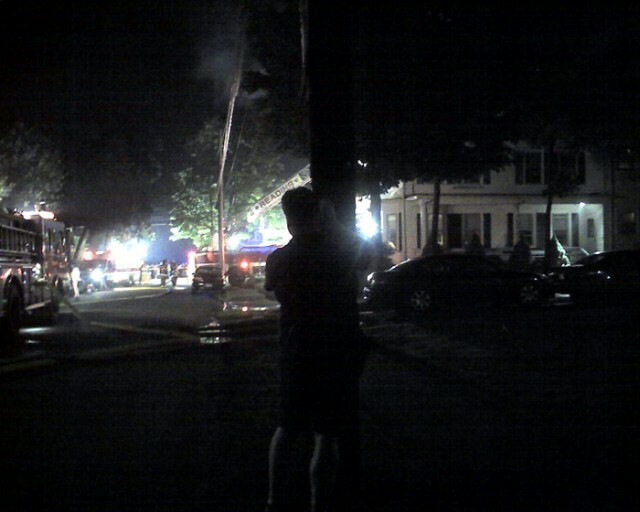 Our town has to call in other towns whenever there's anything bigger than one alarm, so this is the second fire on my block where, in my opinion, it got a little bigger than it should have in the absence of a pumper. 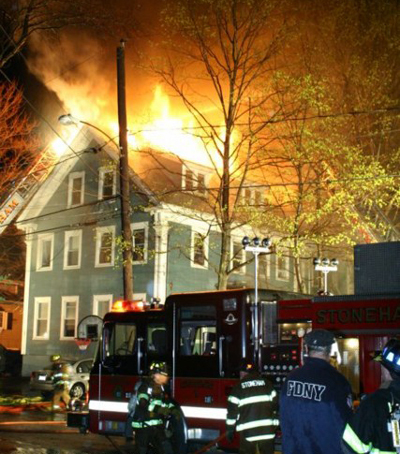 Thankfully two other towns responded to assist our own Stoneham unit within 10 minutes, but not before the fire started threatening the house next door to mine. They evacuated all the families that lived there and I saw my neighbor Joanne walking down the sidewalk with Prince, one of her cats, in a carrier. I took Prince and put him in my guest room so she wouldn't have to stand out there with him crying. No sooner did I get back out on the front porch at the same time as my duplex neighbor to find an officer on my front lawn. "Folks, if you live here, you should start thinking about evacuating, too," he called out to us. I looked at my neighbor. "Great, here we go," I sighed. I had once mused about what I'd do to get my cats out if there was ever a fire, but never actually thought it through. How the hell does one get 10 cats into carriers and out the door?! So I tried... and failed. I got two cats into a carrier, but while doing that, three disappeared into hiding places in the basement. I tried to wrestle two more into carriers, but they kicked the you-know-what out of me and ran off. Frustrated, I threw my hands up and at that point I realized I was able to smell the smoke. That's when Ginny walked up to me, meowing frantically. She has never done that before, which made me believe she was telling me there was something wrong. I really love that cat, even though she still won't let me pet her (except for when she's eating, then she tolerates me gently rubbing her back). I knew there was no way I was catching anyone else, so I went out to check on the fire department's progress. I opened my front door to a fog of white smoke and found my duplex neighbor and his wife on the sidewalk. "Did they contain it?" I asked. 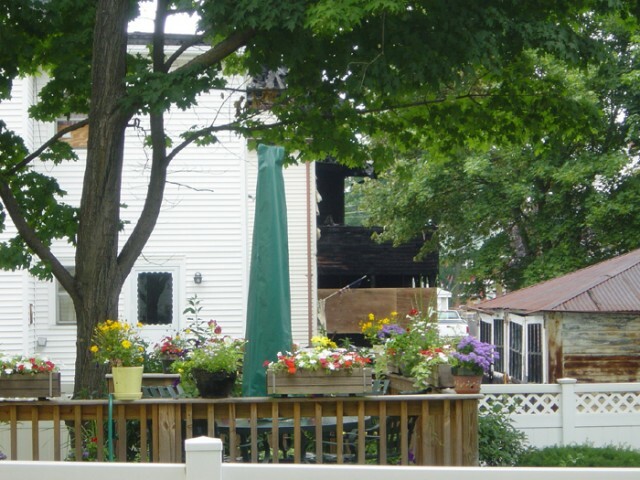 "Yeah, it looks like it started to get to the house next door, but they've been hosing it from all sides," he answered. 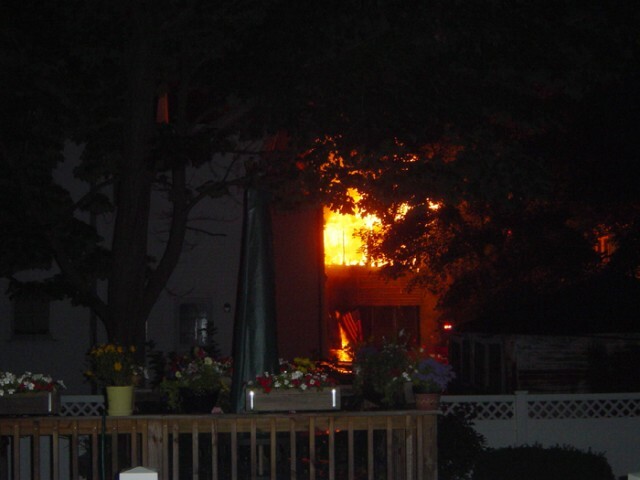 I watched as the fire department hosed down our house as well because there were embers flying everywhere. I sighed with relief. I really need to figure out what to do in case of emergency. I'll probably go buy nets that close with a drawstring. That way if I have to catch anyone fast, I can throw it over them, shove them into carriers and out we go. 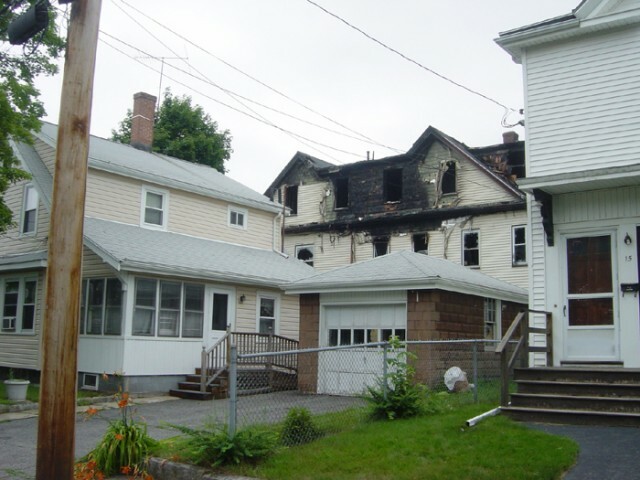 The house was finally contained at around midnight, but was deemed a total loss. I returned Prince to Joanne at 12:30 when the fire department said they could go back into their house, which only suffered melted siding. As I fell asleep around 1:00, I could hear chain saws from firefighters cutting the top of the house to ensure they got all the hot spots out. And here's the view from the sidewalk. The way the house is situated, the driveway and entrance are on the street around the corner, but it's set back so that it's two structures over from me. I'm just relieved things didn't turn out worse. EDIT: This site has some photos from the front of the house, and what you'd see if you were facing my deck on the other side of the house. The fireball on my side was scary enough, but I'm glad I didn't venture around the corner. I probably would have fainted on behalf of the people who lived there.